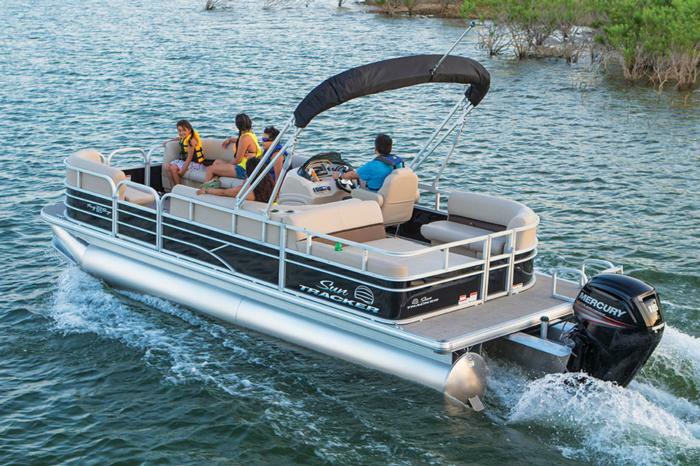 SUN TRACKER is the world’s #1 manufacturer of high-quality pontoon boats meant for family and recreational use. Headquartered in Springfield, Missouri, SUN TRACKER Pontoons sells a wide range of pontoon boats through over 80 Bass Pro Shops® TRACKER BOAT CENTER® locations, in addition to a dedicated network of quality independent dealers distributed throughout the nation. Originally a part of the Bass Pro Shops® since 1972, SUN TRACKER began manufacturing pontoon boats in 1983, and needless to say, hasn’t looked back since. All of SUN TRACKER’s boats are known for their versatility, and the fact that they are outfitted for maximum comfort and style. SUN TRACKER’s boats are known for their rich features such as loaded rotomolded consoles and windscreens, deep and comfortable couches, sleek curves and plush carpeting. What really sets it apart from its competitors, however, is the fact that all of its boats features its exclusive No Haggle No Hassle pricing to enable a no-stress buying experience. SUN TRACKER has, for over three decades, fulfilled the boating and vacationing requirements of families with their state-of-the-art boats. Its boats, each one of which has been carefully created to maintain quality and comfort, have created unforgettable memories for more than two generations of families. SUN TRACKER is the official pontoon boat sponsor for Big Cedar Lodge and Walt Disney World Resort. Headquartered in Lansing, Michigan, Manitou Pontoon Boats makes and offers a wide range of luxury, performance and leisure pontoon boats. Premium Marine is well-known for offering state-of-the-art pontoon boats that are ideal for family and recreational use. Headquartered in Elkhart, Indiana, Bennington Marine is one of the largest pontoon boat manufacturers in the United States and offers a wide variety of premium and luxury pontoon boats.